What did you do on your first day– the day you were born? 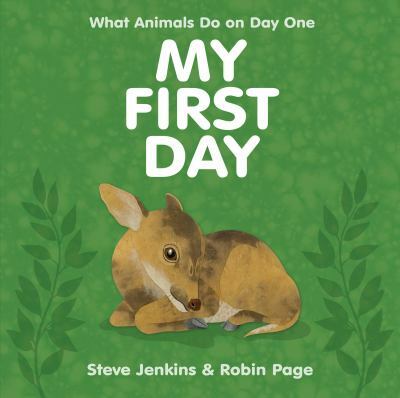 Steve Jenkins & Robin Page answer this question in their children’s book My First Day by describing what happens to animals after they are born. Readers will see that the beginning of animal life is dramatically varied among the twenty-two types highlighted and lovingly illustrated here using paper collage techniques. A one ounce baby wood duck falls from high up in a tree following its mother and siblings to water. But it’s not the only animal to take a great fall. A giraffe tucks its head and falls about 5 feet to the ground at birth. But don’t worry, neither are injured. Some animals are more sedentary like the 2 pound Siberian Tiger cub, which like human babies do little more than sleep and nurse their first few days. 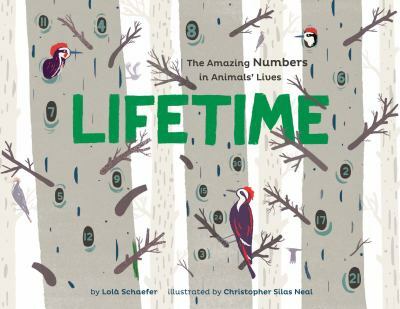 Another 2013 work of high-interest nonfiction that features animals is Lola M. Schaefer’s LIFETIME The Amazing Numbers in Animals’ Lives. The author makes estimates based on the average adult life span of animals & insects in the wild. Selected facts are stand-alone conversation starters so illustrator Christopher Silas Neal’s mix of drawing, painting, print making and digital art make this a memorable read. What kind of superhero types? 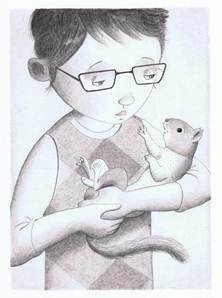 Kate DiCamillo just won her second Newberry Award for a story of a girl and her superhero squirrel. She created a cast of quirky characters that slowly rolls out through mishaps, dissappointments, as well as small victories. Flora Belle Buckman is a bit of an outsider and self-proclaimed cynic living with her mother, an often preoccupied recently divorced romance novelist. She spends much of her time reading and throughout the book references her favorite superhero comic and a work of nonfiction titled “Terrible Things Can Happen To You!” The story begins at the start of summer vacation whereabouts on one afternoon her reading becomes disturbed by the sound of neighbors vacuuming their yard. Somethings strikes Flora as odd about this and she looks out her window just in time to see a squirrel being vacuumed up. After the incident, we gain an unusual vantage that being the squirrel’s perspective. “His brain felt larger, roomier. It was as if several doors in the dark room of his self (doors he hadn’t known existed) had suddenly been flung wide.” Not only has the squirrel has gained in consciousness but also in super rodent powers. He is surprisingly now strong enough to pick up the out of control vacuum and lift it over his tiny head. Other abilities come into play with flying being the least remarkable. 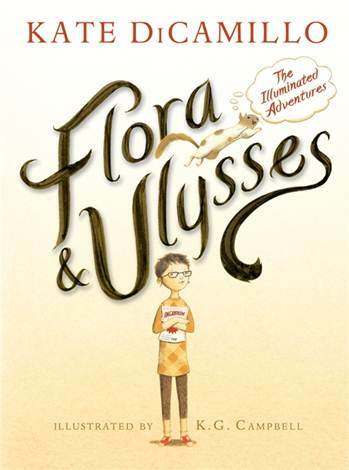 Along the way Flora’s mother takes up a campaign to snuff out the squirrel and hands her ex-husband the shovel to do it with thus cementing her status as the villain of the book. There is a lot of loneliness in this menagerie. And a lot of snacks. With sprinkles even. Endearing pencil drawings of K.G. Campbell that “illuminate” Flora and Ulysses. They have a soft and kind quality that mirror the way the characters in the story slowly begin to interact with one another. Sometimes scenes are enacted in comic panels and othertimes small or full page illustrations accent DiCamillo’s writing. It wasn’t until the very last page that I felt the overall effect. It wasn’t nearly the tearjerker that was The Miraculous Journey of Edward Tulane or as great an adventure as The Tale of Despereaux but it left me with a happy feeling and a definite tendency to look a little closer at the squirrels. So the dust is settling after the past two months spent packing, moving, and unpacking my house all the while juggling a three year old solo. Things are slowly moving back to normal although I admit there are a few boxes that may never get reopened. I’m pretty sure those are the things you are supposed to get rid of before you move, but hey earthly attachments what can you do? Buying a house is a major drain on expenses I am learning but because it’s summer I’ve been doing a lot of fantasizing about taking my little one on a nice long vacation but realistically neither are going to happen this year. Seeing everyone’s beach shots on Instagram isn’t helping matters but it doesn’t mean we can’t explore new places in books. 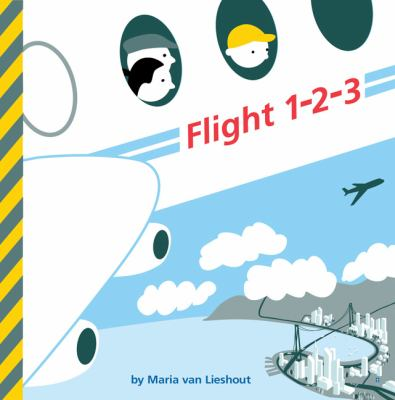 Here are a few recommendations for vicarious picture book traveling. 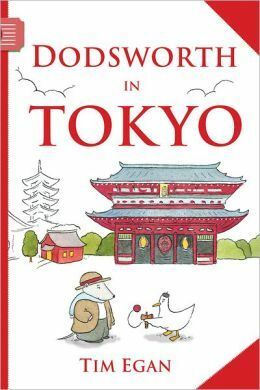 A mild mannered mole travels with his duck companion to Japan for sightseeing. To the surprise of Dodsworth, the duck manages to control himself (most of the time) but occasionally slips up in full public view. This beginning reader book is peppered with Japanese language and culture with characters that both parents and children can identify. 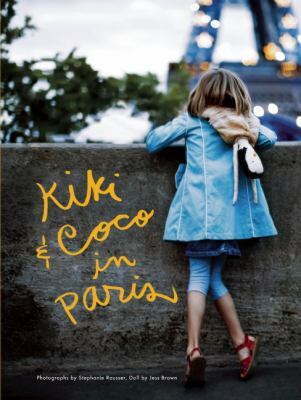 A lucky girl and her doll go on a journey documented in large photographic illustrations to the City of Light. They visit palaces, museums, a Parisian salon, and chic cafés. It will make you dream of visiting there yourself. Sometimes I feel funny about liking a book solely for the illustrations. My dilemma is possibly the inverse of “never judge a book by it’s cover”. Lucky for you, I’ve decided to eschew that way of thinking and share a recently published work for young children simply because of its beautiful pictures. Could a book designed entirely using computer software still be organic and elegant? Surprisingly, yes! You may recognize the work of graphic designer Frank Viva who occasionally does covers for The New Yorker. 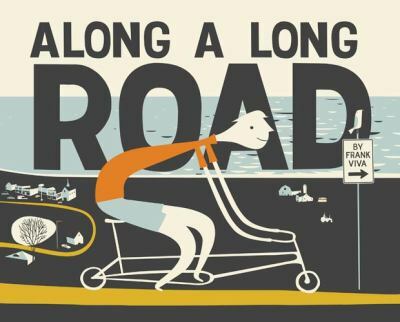 If not, meet Along a Long Road whose title does nothing to mislead. Inside, one seamless (pre-binding, 35 foot long!) scene is divided for readers into a panoramic glimpse of a two wheeled journey. A striking yellow bike trail courses throughout right alongside a lovely blue body of water. Both are accompanied by simple encouraging text. We meet towns and cities, pass through tunnels and go up hills, from day to shimmering moonlit night. We hit a bump in the road and fall off our bikes. Kids will see that it’s easy to get back on and continue your adventure. Close to a year ago, I was a fresh out the maternity ward mama. Those first few weeks are so full. You will be as exhausted as you are in love, and there’s a whole lot of love. You are at the mercy of your newborn. There is no doubt who is in charge. It’s the baby. Last year, Maria Frazee illustrated All the World, which although everyone else seemed to adore, it only made me want to vomit up three decade old shards of my We Are the World cassette. The sap wasn’t her fault, she just drew the pictures- and got a big fat Caldecott Honor medal for it. But man, The Boss Baby is spot on. It’s got new parents pegged. And once you’ve figured out the mystery that is your new bundle, you will find it funny too. Love the executive onesie and adorable ending. Rarely a week goes by without me checking out the Missed Connection section on Craigslist. Once even there was one about me, which was almost titillating, sort of like the lame modern equivalent of getting a note from a secret admirer. So imagine my excitement when I found that one my favorite children’s book illustrators, Sophie Blackall has a blog where she hand picks Missed Connections to illustrate. p.s. Sorry I haven’t written lately, being pregnant messes with the old mind. I randomly snagged a couple of picture book biographies recently, and was totally floored by how amazing the lives of these women were. I’d never heard of Mary Kingsley or Patience Wright, but if you’re looking for some new female role models, here they are. Totally different story, no less cool. Until her parents death, Mary Kingsley lived in the service of her family. Cooking, cleaning, nursing, plumbing. She basically spent the first thirty years of her life stuck playing Cinderella in her gloomy house. One perk was a large collection of books to keep her company. Her father was a traveler and writer, and although rarely present, stocked a great library. After all those solitary years years went by, Mary had a great longing for adventure. So in 1893, still in Victorian garb she left home with the destination of West Africa. There she met murky swamps, enormous beetles, treacherous waters, and unfriendly crocodiles. And guess what? She loved it!